Available in Bright silver the GMB ball marker is a great economical golf product. Fits in any of the Pitchfix branded divot tools. Available in 12 stock color combinations this uniquely styled Pitchfix Hybrid Divot tool is becoming the staple in the golf industry. 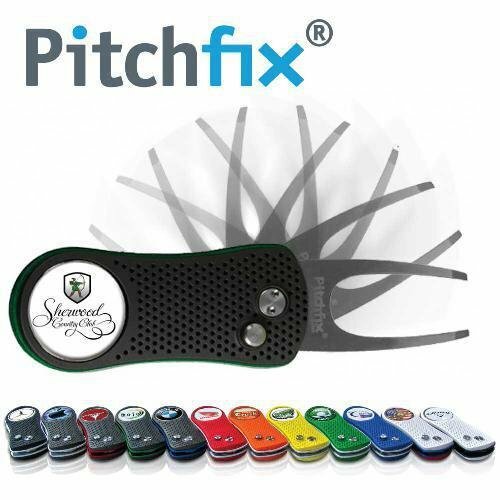 Manufactured with a high quality switchblade mechanism, Smooth and soft ABS rubberized coating and removable ball marker this tool is sure to bring excitement whenever you need to fix your divot or mark your ball. Each tool comes with a removable magnetized ball marker (stock or custom).